Used QSel for a time and liked it. However, it had the same problem as my WinXP toolbars - took forever for the menu to come up. Lately, I've switched to TrayLauncher. It only has the hesitancy problem, occasionally, the first time it comes up - afterwards, works flawlessly. This website is not supposed to replace the home sites of all the apps here! The main purpose of this website is to provide information about the level of applications portability and how this can be accomplished. You did right by searching more info on this app's home page. You are right though, there is always room for improvement and Mr. Andrew is constantly working on this. More screenshots for every application is a good idea but not currently implemented. But saying that this is a matter of laziness?! This is simply not true and not fair. There are so many apps tested and updated on a daily bases! Believe it or not, this requires many hours! Very good program + easy to use. Small size + small memory footprint. Not a bad looking program too if config without the title bar. I find this perfect: better than PStart, though both are excellent. I'm using Qsel a long time ago. Is one of the best launchers. I'm also using Pstart, another excelent program. I have used this program before, but due to computer changes, I did not reinstall it. That was Windows98 and XP, but now that I have Vista, I've reinstalled it, and it is far better than I remember it. 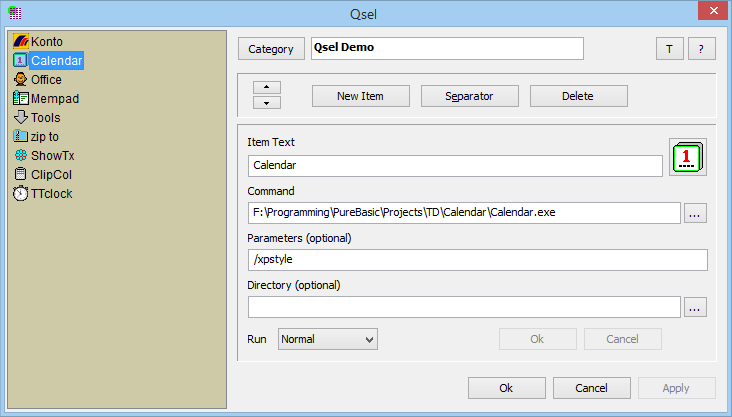 This program is very easy to use, and can be used on your main computer as well as a stick with two separate QSel menus. Also, you really can't beat the price of this handy program...FREE. I've been a long PStart user and its only been recently that I made the switch to Qsel. It far superior, and much easier to use. I really recommend this app! I've loaded it up with app shortcuts, document shortcuts, urls, and explorer folders, and I particularly like the category child windows, much easier for me to navigate than cascading menus. I think that ASuite is the better programm for application menu creation (categories, subcategories, separators, properties, icon tray menu, relative paths, translations...). It's similar to PStart, but it have much more options. Now if it could "close to tray" and find a way to be started from root, all by keeping its conf files in a specified directory, I'm afraid I'd ditch Pstart which I have been using for many years now. Thx for the find, Toxteth! This looks like a nice application. I've been an avid PStart user, but I'm giving this a try. It intrigues me because it has more of a "desktop" feel as opposed to just a list. I only wish you could set global settings that would affect all child pages (such as window size, etc.) This CAN be done manually by editing the .ini file, though. Lots of promise on this one!